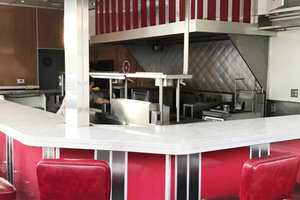 This trendy 1950s-styly American Diner is located in the heart of West Hollywood on the historic stretch of Melrose Avenue between la Brea and Fairfax. 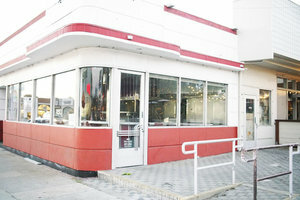 Inside you are greeted with a picture-perfect model of a vintage diner. 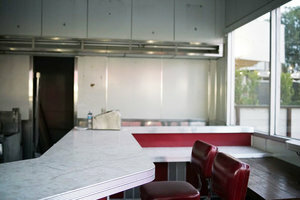 High-ceilings, vintage wallpaper, long marble counters, black and white checkered tile floors, cushy leather booths and an old-school lunch counter-style open kitchen make for a historically sentimental scene. 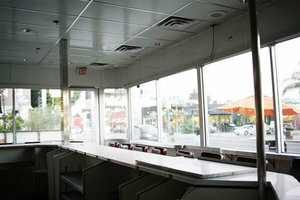 There are 2 separate dining rooms, holding a capacity of approximately 80 people seated. 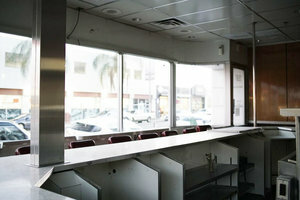 There is a large front patio for seating with easy access to accommodate large trucks and catering/tents. Our rates are seasonal and subject to change. Just contact us about your shoot, and we'll happily get back to you with a custom quote based on your needs!